Opening the Sky: Qatar National Sports Day! Huge banners on buildings and on the street filled Doha yesterday to celebrate Qatar National Sport Day! Since I am an American, I have a brilliant idea for the newly elected United States president or any elected official of another country--if they want to listen. I am sure their constituents will all unanimously agree with the proposal. It is the creation of a National Sports Day, with everyone getting off the day from work and school. Why? To enjoy a day that is devoted to physical fitness, playing a game, learning a new sport, and being outside, is to integrate a more healthy lifestyle. It is to feel more connected with friends, family, and your community. It is to remember to constantly be willing to learn new skills, try different things. We felt revitalized, more alive, but also inspired to implement the adrenalin every day--finding new ways to be active. It sounds like a fantastical dream, but that's exactly what happens once a year in Qatar on the second Tuesday of February. Sheikh Tamin bin Hamed al Thani launched the effort in 2011 before he became the emir of Qatar. 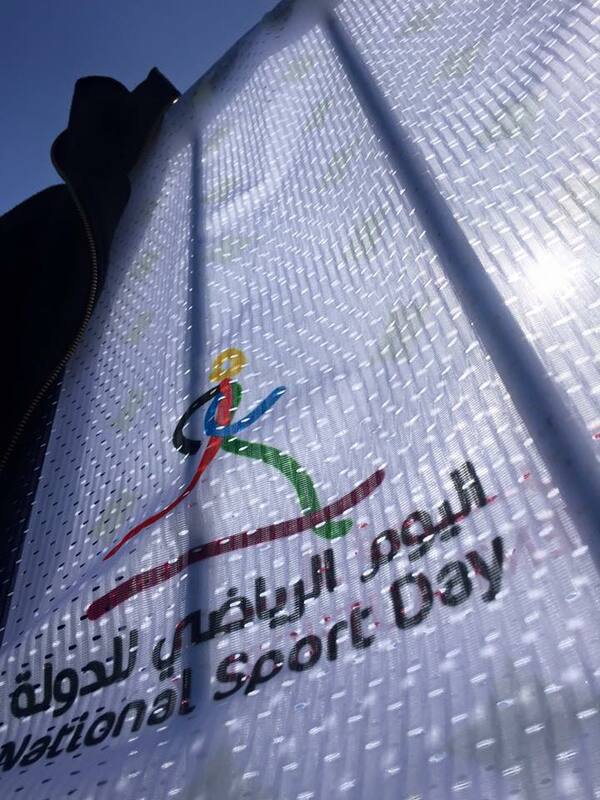 Now in it's fifth year, National Sports Day is increasing its exposure with more events all over the country of Qatar. Different stations were set up in parks, malls, universities, and other public venues of the city to offer people the opportunity to learn how to fence, lift weights, do cross fit, row, rock climb, dance, box. You name the sport, and it was available for the public to try. Thousands of volunteers helped organize classes and games. Exercise and sport businesses opened their doors to teach new skills. For example, down by the Persian Gulf, you could sign up to paddle board or kayak. There were rugby, volleyball, soccer, ultimate frisbee, and basketball games in the parks, with players of every age and level. I could hear many languages and accents on the field as I played a game of ultimate frisbee. No one had to speak the same language. There was a camaraderie that was automatically fostered as we all ran, played, and worked out together. A spark was kindled and fanned to do and be more. Volunteers teaching people how to throw a frisbee, in preparation for an ultimate frisbee game--if they choose. With signs on the street this week that read, "Unlock your secret athlete," and "You are stronger than you think," thousands flocked to a national sport party. The whole country, it seemed, were all getting some physical exercise--together. There were 10K, 5K, 3K, and even a short "Doha Dash" for beginner runners. 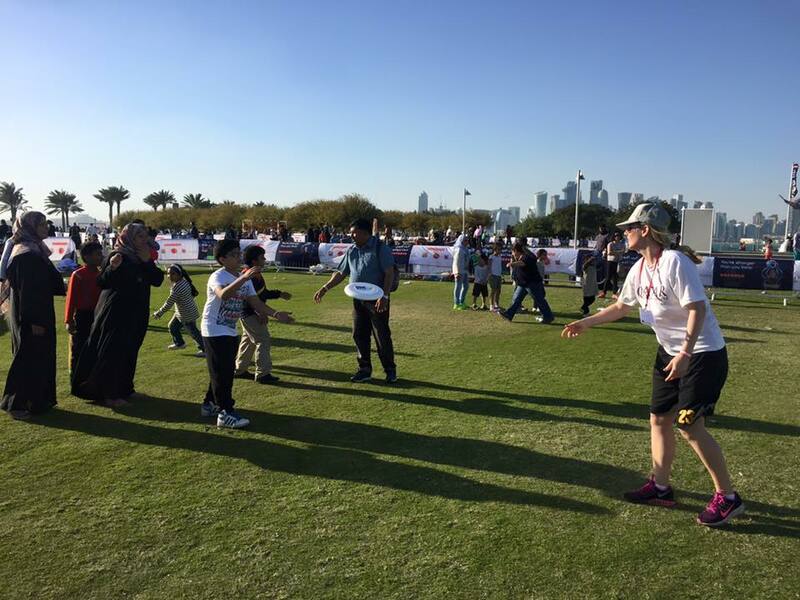 People with disabilities were represented too #NSD2016 #MoI_Qatar Personally, I loved reacquainting myself with the game of ultimate frisbee on the park next to the Museums of Islamic Art. 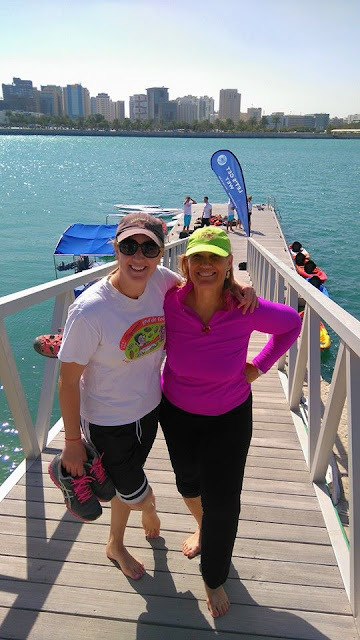 To sign up for a free paddle boarding excursion on the Persian Gulf with family and friends was renewing. It was a blustery, windy day out on the water, but so much fun!! When I asked one Philippine worker if she had a great Sport's Day, she said, "I went to the mall and played volleyball and ran with people from my company. My boss gave us a free dinner at the mall that night too." One teenager from the US said to me this morning, "I am already planning a big day to be with friends outside again soon." Other people in my compound competed in the running events. I think the best part of the Sport's Day is that everyone was involved,--every age, ability, socio-economic level,. The entire country just focused on aspiring to a new fitness level. I am already looking forward to next year! Some of the young tween and teen girls in my compound have already asked to play some tennis games with me, after Sport's Day. It seems everyone is a little more motivated to try a new sport or improve the one they play. Others are more enthused about teaching others to love their sport. I have already decided to be on the Persian Gulf soon--maybe learning to parasail! Thanks Qatar for the best sports party I have ever attended! We will be definitely be back next year!! Paddle boarding with the Blue Pearl, a group that teaches kitesurfing, and other watersports. They offered free classes for kayakers and paddle boarding for Sport's Day. Pick up soccer games were everywhere yesterday in Doha for Sport's Day. There were even free water stations everywhere to enjoy (see the boxes of water on the side of the path). Free kites were given out for Sport's Day--the perfect gift for a windy day on the Persian Gulf. You can see we will all be excited for next year's National Sport Day. Are there any other countries, places ready to take on a National Sport's Day, maybe a City Sport's Day, or even a Family Sport's Day? This was the logo for the staff volunteers who helped instruct and organize at Qatar National Sport Day. I think it says it all: we are stronger than we think!